This is the story of my Little One’s caesarean birth. I wrote this to tell at her 4th birthday party, although I told a simplified version. 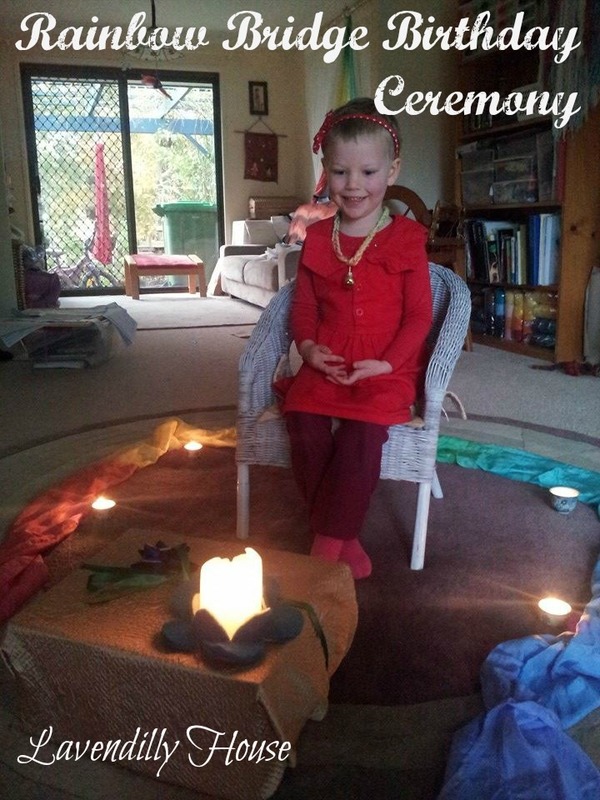 My Little One sat on her birthday pillow, inside the silk rainbow circle, and I told this story with only a little bell as a prop in the story. At the end I put a rainbow necklace with a bell on it over her head. She felt so special. In a little house by a creek there lived a family of fairies. There was Mumma and Daddy fairy, and Brother and Sister fairy. Mumma was a water fairy, Daddy was a wind fairy, Brother was a fire fairy and Sister was a song fairy. They were happy together, each one unique, each one interested in different things, but all living harmoniously together. One day Mumma thought she heard the jingling of a little bell. It was only faint, but it jingled on and off all day. “Do you hear that?” she asked Daddy. Daddy couldn’t hear it at first, but after a while, if he listened carefully, he could make out the sweet faint jingling sound. Day after day the fairy family would make their home ready for their new Little One, and the ringing grew louder and louder! Everyone was very excited. But one morning Mama Fairy woke up because the jingling sound wasn’t loud. It was very soft, and it didn’t ring very often. As the morning went on, the sound stopped all together. Mumma could feel her Little One in her heart, and deep inside her womb she knew her baby fairy would be coming today, but she couldn’t hear the clear ringing of her Little One’s bell at all! This worried her. They all tried to use their talents to help their Little One come. Mumma the water fairy rocked and danced like the gentle waves of a river. Daddy the wind fairy spoke words of wisdom and bravery, encouraging Little One (and Mumma) to not be afraid. Brother the fire fairy used his fire talent to make their home warm and welcoming. Sister the song fairy sang to their Little One a song of love and joy, calling for the sound of the bell. But no bell could be heard. All was still and quiet. They needed some more help. Daddy called a Healer Fairy to come and help them call their Little One in. Jingle, tinkle, ring it well! All was still, even their house was quiet, as everyone listened carefully for the ringing, jingling sound. Still the baby fairy’s bell remained silent. The Healer Fairy told Mumma and Daddy that she would need some more help, and they would need to visit the Great Healing Hall because the magic was powerful there, where lots of healer fairies worked together. A faint, sweet jingling. There it was! They could all hear it! The healing fairies rested their wands on Mumma Fairy’s brow and asked her “Are you ready for your Little One to come?” Mumma held Daddy’s hand. She was ready. They were all ready. It was time and they could hardly wait. The healing fairies rested their wands upon Mumma Fairy’s heart and asked her “Are you ready to receive your Little One with love and openness, however your Little One arrives?” Mumma Fairy was ready. Her heart was now bursting with the sound of her Little One’s bell. A soft feeling, almost like sleep swept over her as she relaxed, ready to receive. The fairies outside the Great Healing Hall kept singing and chanting. Daddy Fairy and Mumma Fairy held each other, and held their breath with anticipation. They could hardly wait to meet their Little One. The healing fairies drew a line with fairy magic across Mumma Fairy’s womb with their wands, and a door opened. From this door came a bridge of rainbow light – and a loud clear ringing sound filled the room as a little baby Rainbow fairy came through the door, lifted over the bridge of coloured light, helped by the healing fairies, landing snuggly in Mumma Fairy’s arms. Their Little One was perfectly well, perfect in every way, and slept in Mumma’s arms safe and sound, ringing gently as she breathed. The healing fairies waved their wands again and as the door in Mumma’s womb was magically closed, the bridge of rainbow light disappeared. All was still, all was quiet, and cloaked in peace. Only the sound of singing from the fairies outside of the Great Healing Hall drifted in through the windows. Everyone smiled. Brother and Sister Fairy were delighted to meet their sister, Little Rainbow Fairy , and they took turns holding her and talking to her. Brother Fairy warmed her and Sister Fairy sang to her. And do you know, that’s exactly what happened. 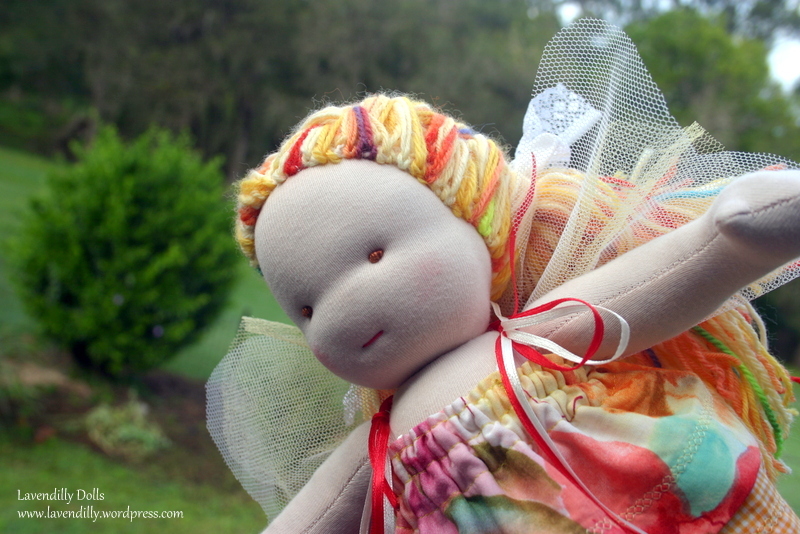 Four years have passed, and the Little Rainbow Fairy still wakes up every day, ringing and jingling happily, finding adventure every where she looks. She was a planned home birth, but it seems our Little One had something else in mind. In the end we went to hospital because our baby was very quiet and still, with a faint heart beat. It just so happened that on this same day many of my friends and community were outside the hospital attending a rally in support of the re-opening of the Gold Coast Hospital Birth Centre. They were singing and chanting together and I could hear them from my room. It gave me great comfort to know they were outside while I was inside with my husband and our two wonderful midwives, who were really looking after me. Caesarean was exactly what we were trying to avoid, but in this case I felt supported in the decision to go ahead. In the end our Little One was perfectly fine, the little cheeky little thing. A picture of perfect baby health. We have just celebrated her fourth birthday and she has grown into a bright, cheery and chatty little thing – always ready for the adventure each day brings. I thought that I had already processed her birth, and found myself ok with how it unfolded, despite our worry about her at the time, and my very ordinary recovery after surgery … but writing this story brought me more joy on another level, and I found a new kind of acceptance and peace with my experience. I hope, if you have experienced an unplanned cesarean, that you find some solace and beauty in my story too. Cold Birth: Reclaiming my Labour – my immediate reflections about this birth and my thoughts about what it was like to give birth without labour. Jennifer tells the story of her daughters birth, not her Plan A, but a story that highlights that deviation from expectation do not need to be dramatic or traumatic. That even the birth you most wish to avoid, can be a wonderful beginning. This is a story that tells us that Positive Language makes a difference. The Little Fairy will grow up knowing her birth was a positive one, a supported one, one that was filled with love. Not fear, drama or disrespect. What a lucky girl your daughter is to have such a loving warm, creative Mum! Doesn’t she look like a mini-me of you too! It is an exquisite and important story because it addresses a common disppointment mother’s experience and puts that into perspective so lovingly! I could imagine in it a collection of stories like Susan Perrow’s. I am so glad you have published it on your beautiful blog so that others can enjoy it also! !